Today, Danish shipping group DFDS signed an agreement to acquire 98.8 % of the shares in the shipping company U.N. Ro-Ro from Turkish private equity companies Actera and Esas for a price of EUR 950 million. U.N. Ro-Ro is Turkey's largest operator of Ro-Ro freight ships, and a strong addition to DFDS' large shipping network in the Baltic Sea, The North Sea and the English Channel. In the Mediterranean, DFDS is today represented by a route between France and Tunisia. 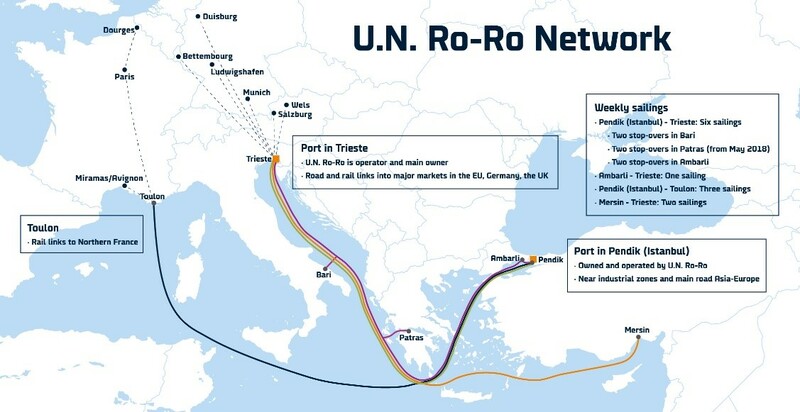 U.N. Ro-Ro operates five major routes between Turkey and the EU, connecting the Turkish ports of Pendik, Ambarli and Mersin with Trieste and Bari in Italy, Toulon in France and Patras in Greece. The company operates and owns a fleet of 12 large Ro-Ro ships and operates port terminals in Pendik, Istanbul, and Trieste in Italy. In cooperation with rail operators, U.N. Ro-Ro also offers intermodal transport between key EU markets and the ports. "The operation of Ro-Ro ships and operation of port terminals handling a high number of unaccompanied trailer units - and containers for reloading to rail transport in the ports - are very similar to DFDS' business in the North Sea. So are the goods transported - machinery, automotive parts, vehicles, electronics, computers, plastic products, textiles, clothing, food, fruit, beverages and other," says Niels Smedegaard. DFDS is even familiar with the ships as they were all built at the Flensburg Shipyard in Germany where DFDS has also been building efficient ships of a similar modern design. Many of the trailers and containers transported between manufacturers and their customers via France and Italy will be using DFDS' ferries in the Channel and in the North Sea. "I look very much forward to welcoming U.N. Ro-Ro to DFDS. I am also very pleased that the skilled and professional management of U.N. Ro-Ro have decided to stay with us and help us ensure that all our current and new employees and customers benefit from this," says Niels Smedegaard.